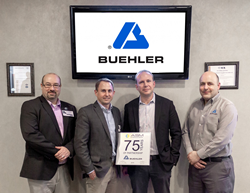 Buehler, An ITW Company and ASM International are celebrating 75 of continuous partnership in 2019. The pinnacle of this relationship is Buehler’s continuous support of the ASM World Training Center in Novelty, Ohio through its innovations for metallography and hardness testing, solutions for the newest materials and participation in ASM International activities. Ryan Milosh of ASM proclaims, “As materials for aerospace, automobiles, electronics and medical devices evolve at a rapid pace for Industry 4.0, organizations like Buehler and ASM International lead the charge by offering equipment and training to meet the needs of cutting-edge organizations." Buehler’s metallographic preparation equipment –the IsoMet High Speed precision saw, the SimpliMet 4000 duplex mounting press, the Wilson VH Series hardness testing equipment with automated DiaMet™ hardness testing software, and consumables are available at the ASM Training Center. It is Buehler’s aim to continue to update the ASM Training Center with the latest sample preparation machines. ASM uses these new instruments in advanced metallography training courses designed to teach participants about high precision manufacturing and materials testing techniques. Customized metallographic solutions for new materials or processes are available at Buehler’s Global Solution Centers. ASM International is the world’s largest association of materials-centric engineers and scientists. They are dedicated to informing, educating, and connecting the materials community to solve problems, improve materials performance, and support professional development. To learn more about ASM International, visit http://www.asminternational.org. Buehler, An ITW Company, is a global industrial manufacturer of value-added sample preparation equipment, consumables and hardness testing equipment with related service businesses. The company innovates solutions and offers expert service and support throughout the materials preparation and analysis market. For additional information on the Buehler product offering please visit http://www.buehler.com or contact Buehler at marketing(at)buehler(dot)com USA 1-847-295-6500.